10 A None No Power Seat 10 A is a standard Premium Economy Class seat that is missing a window. 10 K None No Power Seat 10 K is a standard Premium Economy Class seat that is missing a window. 13 A None No Power Seat 13 A is a standard Premium Economy Class seat that is missing a window. 13 K None No Power Seat 13 K is a standard Premium Economy Class seat that is missing a window. 16 A None No Power Seat 16 A is an Economy Class seat that may have limited recline. Moreover, proximity to the lavatories may be bothersome. 16 C None No Power Seat 16 C is an Economy Class seat that may have limited recline. Moreover, proximity to the lavatories may be bothersome. 16 D None No Power Seat 16 D is an Economy Class seat that may have limited recline. Moreover, proximity to the lavatories may be bothersome. 16 E None No Power Seat 16 E is an Economy Class seat that may have limited recline. Moreover, proximity to the lavatories may be bothersome. 16 G None No Power Seat 16 G is an Economy Class seat that may have limited recline. Moreover, proximity to the lavatories may be bothersome. 16 H None No Power Seat 16 H is an Economy Class seat that may have limited recline. Moreover, proximity to the lavatories may be bothersome. 16 K None No Power Seat 16 K is an Economy Class seat that may have limited recline. Moreover, proximity to the lavatories may be bothersome. 22 A None No Power Seat 22 A is an Economy Class Exit Row seat that has extra legroom however, the proximity to the lavatories may be bothersome. Passengers have reported that these seats tend to get cold during the flight due to the Exit. It also has limited recline and under seat storage space. 22 C None No Power Seat 22 C is an Economy Class Exit Row seat that has extra legroom however, the proximity to the lavatories may be bothersome. Passengers have reported that these seats tend to get cold during the flight due to the Exit. It also has limited recline and under seat storage space. 22 D None No Power Seat 22 D is an Economy Class Exit Row seat that has extra legroom however, the proximity to the lavatories may be bothersome. It also has limited recline and under seat storage space. 22 E None No Power Seat 22 E is an Economy Class Exit Row seat that has extra legroom however, the proximity to the lavatories may be bothersome. It also has limited recline and under seat storage space. 22 G None No Power Seat 22 G is an Economy Class Exit Row seat that has extra legroom however, the proximity to the lavatories may be bothersome. It also has limited recline and under seat storage space. 22 H None No Power Seat 22 H is an Economy Class Exit Row seat that has extra legroom however, the proximity to the lavatories may be bothersome. Passengers have reported that these seats tend to get cold during the flight due to the Exit. It also has limited recline and under seat storage space. 22 K None No Power Seat 22 K is an Economy Class Exit Row seat that has extra legroom however, the proximity to the lavatories may be bothersome. Passengers have reported that these seats tend to get cold during the flight due to the Exit. It also has limited recline and under seat storage space. 23 A None No Power Seat 23 A is an Economy Class Exit Row seat that has extra legroom however, it may have limited under seat storage space. 23 C None No Power Seat 23 C is an Economy Class Exit Row seat that has extra legroom however, it may have limited under seat storage space. 23 D None No Power Seat 23 D is an Economy Class Exit Row seat that has extra legroom however, it may have limited under seat storage space. 23 E None No Power Seat 23 E is an Economy Class Exit Row seat that has extra legroom however, it may have limited under seat storage space. 23 G None No Power Seat 23 G is an Economy Class Exit Row seat that has extra legroom however, it may have limited under seat storage space. 23 H None No Power Seat 23 H is an Economy Class Exit Row seat that has extra legroom however, it may have limited under seat storage space. 23 K None No Power Seat 23 K is an Economy Class Exit Row seat that has extra legroom however, it may have limited under seat storage space. 44 D None No Power Seat 44 D is an Economy Class seat whose proximity to the galley and lavatories may be bothersome. 44 G None No Power Seat 44 G is an Economy Class seat whose proximity to the galley and lavatories may be bothersome. 44 H None No Power Seat 44 H is an Economy Class seat in the last row of the plane and may have limited recline. The close proximity to the galley and lavatories may be bothersome. 44 K None No Power Seat 44 K is an Economy Class seat in the last row of the plane and may have limited recline. The close proximity to the galley and lavatories may be bothersome. 45 D None No Power Seat 45 D is an Economy Class seat in the last row of the plane and may have limited recline. The close proximity to the galley and lavatories may be bothersome. 45 E None No Power Seat 45 E is an Economy Class seat in the last row of the plane and may have limited recline. The close proximity to the galley and lavatories may be bothersome. 45 G None No Power Seat 45 G is an Economy Class seat in the last row of the plane and may have limited recline. The close proximity to the galley and lavatories may be bothersome. 6 A None No Power Seat 6 A is a standard Premium Economy Class seat that is missing a window. 6 K None No Power Seat 6 K is a standard Premium Economy Class seat that is missing a window. 7 A None No Power Seat 7 A is a standard Premium Economy Class seat that is missing a window. 7 K None No Power Seat 7 K is a standard Premium Economy Class seat that is missing a window. 9 A None No Power Seat 9 A is a standard Premium Economy Class seat. 9 K None No Power Seat 9 K is a standard Premium Economy Class seat. Condor Flugdienst flies this version of their Boeing 767-300ER in a three class configuration with 18 angled flat Business Class seats, 35 Premium Economy seats, and 206 standard Economy seats. Perfect legroom seat, but gets very very very cold. I agree, This seat (and seat E and G) are normal seats without any extra legroom. Only seats 23 AC / HK have extra legroom. 2 film (no italian) and a good collection of music. Very cold position, Bed meals. The most uncomfortable intercontinental "business class" seat I have ever had the misfortune of paying for. Utterly no storage at ground level and a very narrow opening for feet/legs once the seat is reclined, and at 6'5" I could not come close to stretching out when reclined. Seats do not lie fully back - 170 degrees is claimed but did not seem to be anywhere near that. 19" pitch is ludicrous for intercontinental business. Very easy for things to slip behind the seat where they are nearly impossible to recover (thank you to the FA who retrieved my passport from this coffin). Good entertainment system but limited choices. Very good service belied the numerous issues in the cabin. This seat (and seat E and G) are normal seats without any extra legroom. Only seats 23 AC / HK have extra legroom. Very standard small legroom seat. I'm 1,94 and had trouble with legroom, especially when the person infront decided to recline their seat. Had to put one leg out on the aisle and the other knee behind the front armrest, not very comfortable. Took this flight over and back to Germany. Had this seat on the return flight. The lack of leg room was noticable. The person in seat 41A could hardly move. It was very difficult to do foot exercises to ward off cramping. This seat is in the first row of standard economy behind premium economy. Premium economy seats recline further than standard economy seats. Therefore I was boxed in a very narrow space once the passenger in front of me fully reclined their seat. Worst seat I have ever had on a long haul flight (flight was SAN to FRA). Don't book seats 6h/k . Unlike in the plane graphics, there is a row 5 on this plane, where the flight crew can sleep. Because of the curtain surrounding row 5, there's no in-flight entertainment in the seats in front, but instead in the ceiling. Very uncomfortable to watch. Makes the neck hurt! Great seat -- MUCH more legroom than other Premium seats due to crew rest in front. 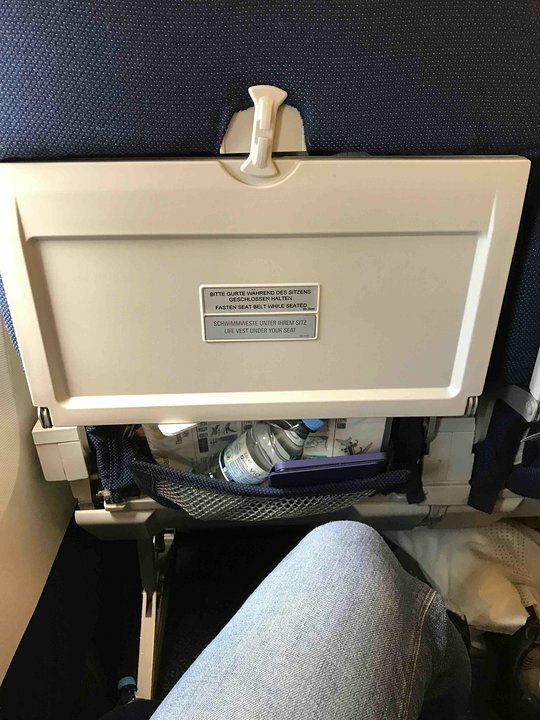 I'm 6'1" and I had a good two feet between my knees and the seat in front. 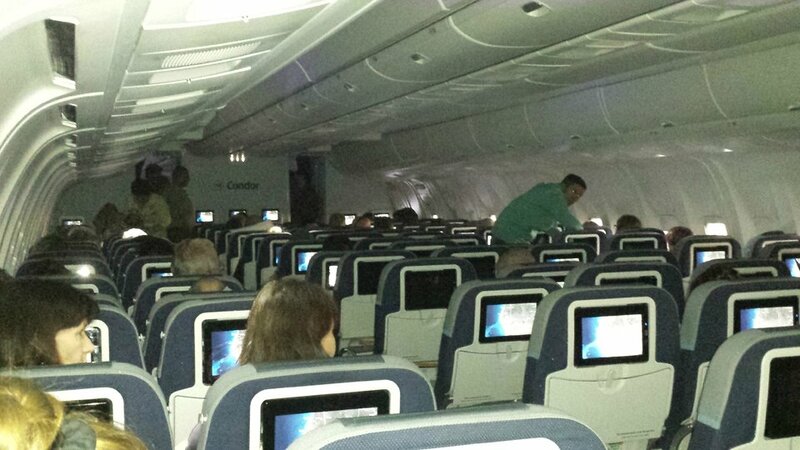 IFE screens are located overhead, which is a bit awkward, and no footrest. But for me, the legroom wins! Premium Economy has plenty of legspace, which is nice. But the seats are still not very comfortable, especially when reclined, so I still did not get much rest. But Premium Economy with Condor was Cheaper than Economy with other options for this flight, so cheap and slightly better is a win for me. With the exception of a few seats, it does not matter where you are sitting in the economy class. The seat distances are much too small, even a normal-size person cannot stretch the legs. Unfortunately, other airlines (such as Swiss) are imitating this profit-oriented policy. If humans were animals, the animal welfare association would come and blame the airlines for animal cruelty. One should force our politicians to fly such type of economy class for a year, maybe something would change. Dear Condor: Take out a couple of seat rows and enlarge the distances between the rows. Of course, the prices have to go up a bit, I do not want you to lose money. Thereafter you can make less of the premium class, which is anyway only eyewash, according to people who have flown in it. On the other hand, your staff is very friendly and cannot be blamed them for the sins of the management. 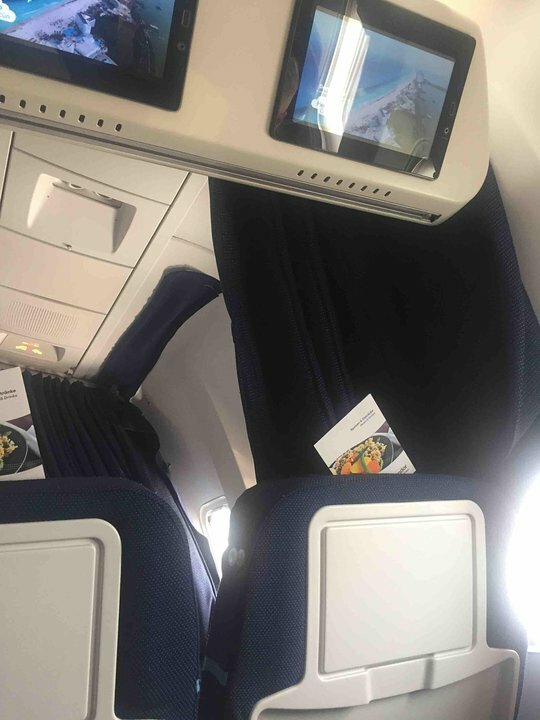 I booked 2 business class seats but the aircraft sent from Frankfurt to BWI was different and had no business class seats (see other comments for same problem). We were put in Prem Economy and told Condor would contact me for refund. They did not. I sent complaint in via their website and got an immediate reply (in German) with a reference number saying I should be "patient". 15 days later I called Condor and was told it would take 6-8 weeks to resolve! The Premium Economy seats were OK, but sleeping was virtually impossible. 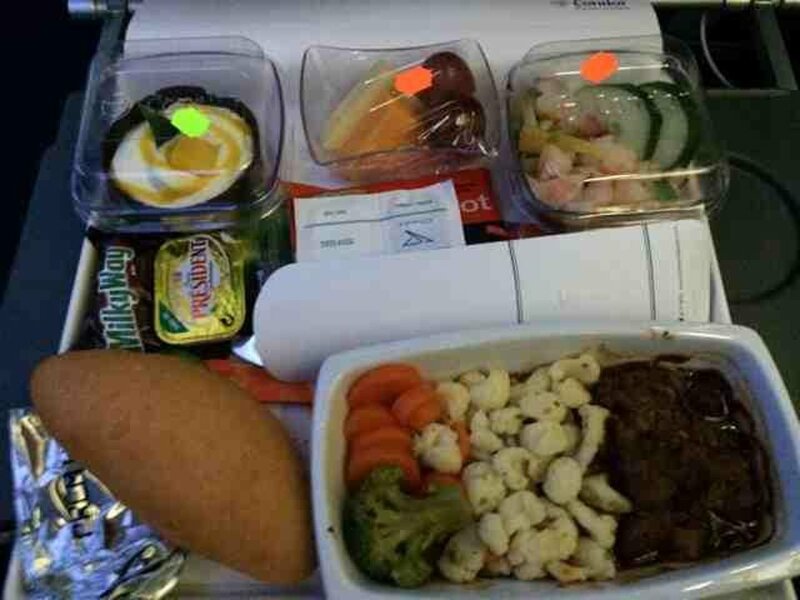 Otherwise, the flight was OK. Good service, OK (not great) food. Used the summer seasonal service between Frankfurt and Austin and was very pleased with the Condor B767-300ER. 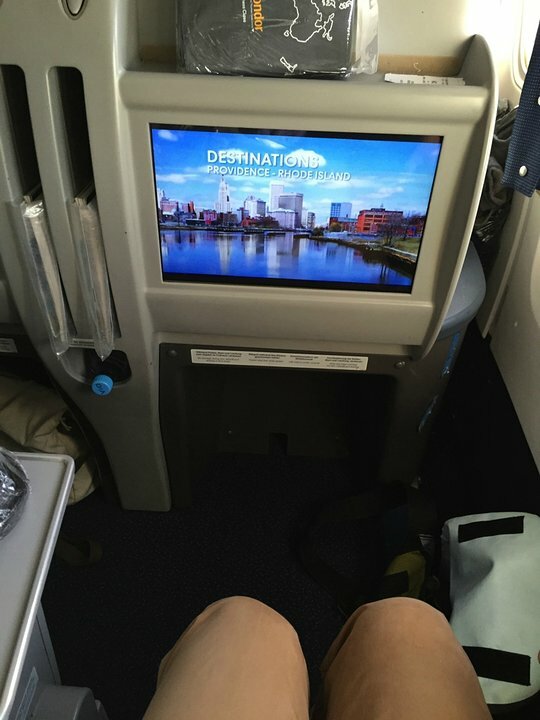 Paid extra for 23H (exit row) and was well worth the money. Excellent leg room, seat was comfortable and had a nice recline. I didn't find the exit row seats particularly cold, but, Condor staff where nice to provide extra blankets if other passengers requested. Nice HD monitor at every seat. You have to pay extra for more expanded movies but I always download movies I actually want to watch on my tablet. Regular economy seats look a little tight for a larger person but nothing torturous at all. Service was friendly and professional. Seats 22 A&C are situated in between two exit-doors, the temperature here is freezing cold and the seats can't be reclined at all!!! Impossible to sleep in these conditions on a long distance flight! Nobody informed us at the registration desk! We payed the same as everybody but had to accept unacceptable conditions of flight! Will never fly CONDOR again! It is extremely cold in the area around seat 22K. I've made an online check-in at the Condor homepage and had to see that they seated my wife at 22K. There was online no chance to change the seat. I told my wife to ask Condor at the airport, but they refused changing the seat. We are very disappointed of Condor. It is very cold there from the door, which isn't isolated well! And it isn't an extra legroom, because the toilets are right in front of you. I was ill after this flight in this seat! Half decent seat as seats behind are sealed off and taken by crew for rest. This means there is no-one behind for much of the flight. Like so often, no overhead bin available as it it used for equipment. It is extremely cold. So grep as many blankets as you can. They are above the seatrow behind you. Extra legroom and 2-3-2 config was quite comfortable. Food very so-so. Staff ok.